This special championship set features one (1) All Leather Game Model NBA Championship Trophy Basketball and one (1) NBA Champions Custom Display Case. 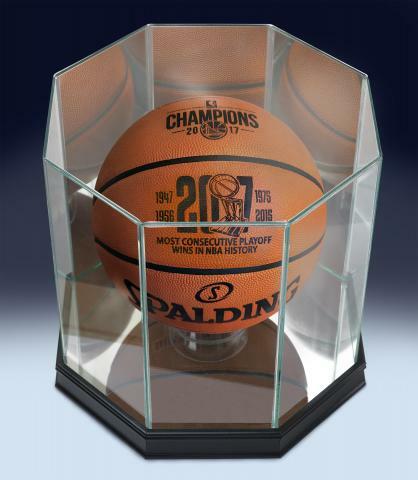 Your custom All Leather ball and handsome display case is the ideal commemorative set to honor the 2017 NBA Champion Golden State Warriors, the team's amazing playoff run, and unprecedented 15-straight postseason victories. From start to finish, the Warriors found a way to finish every playoff series, including the Finals vs. the Cleveland Cavaliers. Due to expected high demand for this set we must charge your credit card for the full price immediately upon taking your order. This policy ensures we reserve a set for you. We will confirm your order by Email. This ball is not game used. Please allow 4 to 6 weeks for delivery. *Final artwork designed pending approval. 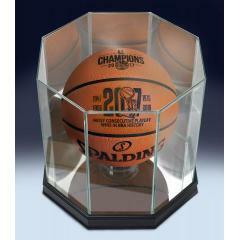 Warriors 2017 NBA Champions Most Consecutive Playoff Wins Game Ball and Custom Display Case $279.95 Sold Out!